Even as you descend the outdoor stairs, you feel like you are being transported to another, more beautiful world. Bamboo lines the top of the walls of the courtyard, and floor to ceiling windows lead you into a sleek, sophisticated space where plush blue seats surround one of the most gorgeous bars I’ve had the pleasure of sitting at. “We want you to forget where you are. 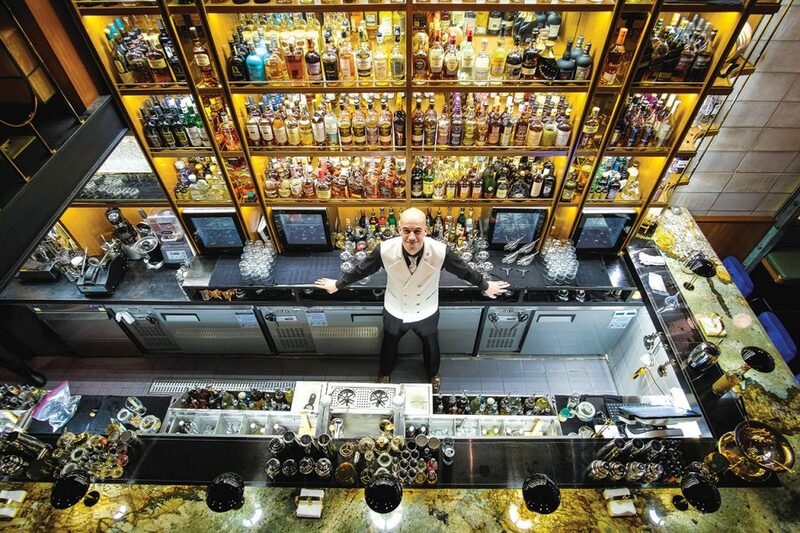 We want you to think, maybe I’m in Seoul, maybe I’m in Paris,” says general manager and beverage director Bob Louison. Booth seats on the second floor continue the old-fashioned, first class train car design, which was created with the drinks menu in mind. 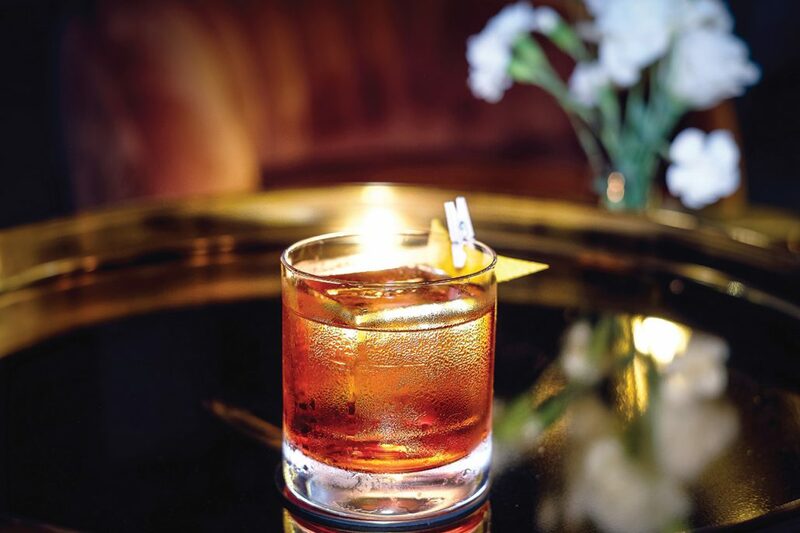 “We hope this bar makes you feel like you’re traveling, you’re having a good time, and discovering new flavors as you travel,” explains Louison. The Pussyfoot Saloon — so named to keep in line with the train travel theme; pussyfoot is another name for a railroad cop — is the newest addition to Seoul’s cocktail scene and is vying to put the city on the world map for classic and signature cocktails with its knowledgeable service in a decidedly sophisticated and classy style. “I think we’re ahead of the curve in terms of service and hospitality and the drinks we are trying to achieve,” says Wendell Louie, proprietor. This writer couldn’t help but agree. The two men of experience and expertise came together to come up with the concept and execution. Korean-American Louie was looking for another project after the success of Mix & Malt, an American style bar and restaurant that also boasts a nice selection of cocktails, while Parisien Seoul-based Louison is a veteran bartender and bar consultant, and the brains behind Seoul’s Sool Bar Week that brought together local and international drinks experts for masterclasses and events at a variety of bars in Seoul last fall. Cocktails are generally considered an American invention from the late 1700s, though there is evidence it may be the English who invented both the drink and its name. Either way, one can say they disappeared from drinks menus only to return in the late 1990s in New York, their renewed interest spreading to Europe. Asia later followed suit, but it wasn’t until the last five years that they really got started in Seoul with American-style bars popping up. 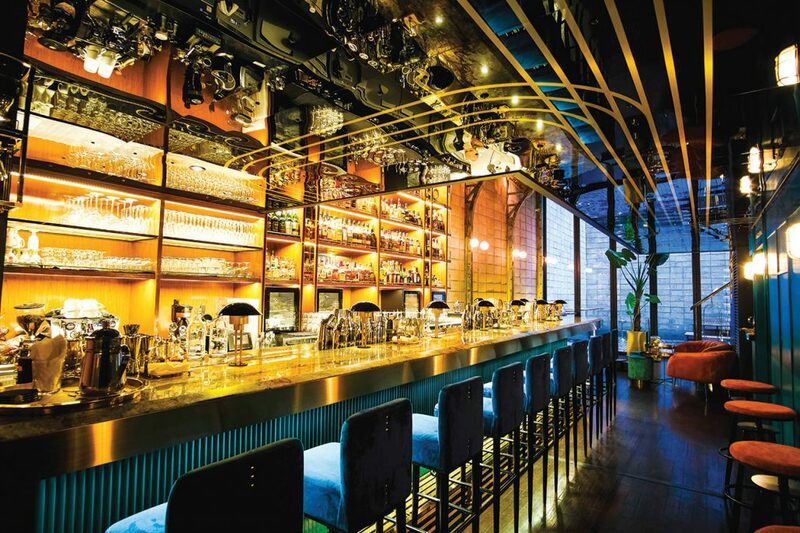 The World’s 50 Best Bars list started nine years ago, with Asia’s Top 50 Best Bars now in its third year of existence. Korea had four bars on the latter list for 2018, announced this spring. And Louie hopes to make both lists with the Pussyfoot Saloon. While plans are to continually expand the drinks list, eventually also adding a food menu, the pair wanted to open with a list of classic cocktails blended with their own signature cocktails. In line with that, the cocktail menu doesn’t just list cocktails, but also their story or background, and are categorized by type such as Martinis, Sours, and Fizzes. Here are three cocktails to get you started at the Pussyfoot Saloon. I could not recommend this bar and their perfectly-made cocktails more. Start your cocktail ride with one of their signature sour cocktails, the Modern Tea Punch. Made with house simple syrup, fresh lime juice, VSOP cognac, and green tea leaves shaken and served in an old-fashioned glass, it is refreshing with a subtle, well-balanced tartness. My go-to cocktail is the Italian Negroni: one part each gin, vermouth, and Campari garnished with orange peel. The peel was so fresh, so fragrant, I thought I might have gone to Negroni heaven. Louison imagines an expanded cocktail list where he might have more than 10 variants of this classic. If he does, I might have to reserve a permanent spot at the bar. Legend has it that the Ramos Gin Fizz (renamed after its creator Henry C. Ramos in New Orleans back in 1888) required 12 bartenders to take a turn shaking the cocktail for a minute each before it got passed on to the next to preserve their stamina for the next order. Shaking time has gone down to 6 minutes now, but the Pussyfoot Saloon has invested in a sharking machine to ensure no arms get too tired in the making of this time and labor-intensive concoction. Made with a base of gin, heavy cream, egg white, and fresh lemon juice, it is both lightly refreshing and silky, creamy and elegantly sweet.